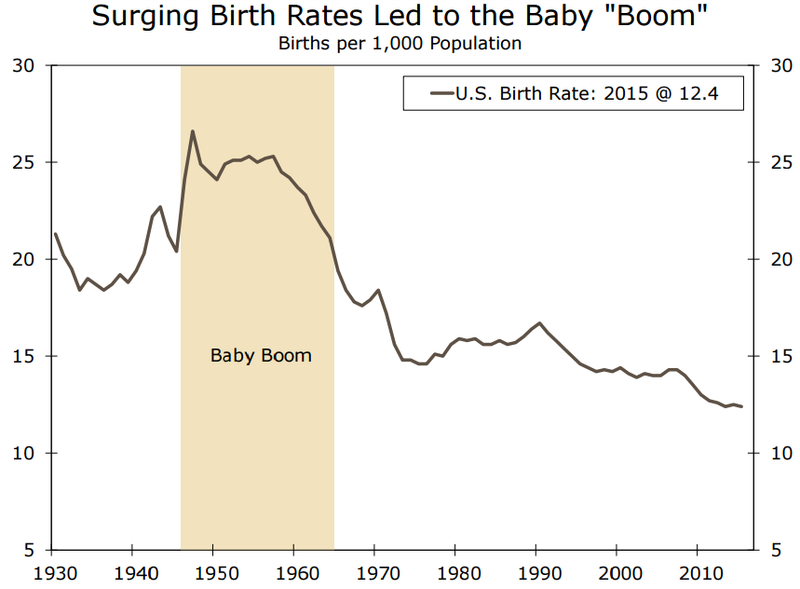 Baby Boomers are Americans born between the years 1946 and 1964, and the oldest members of this generation already started to reach the traditional age of retirement around 2011. 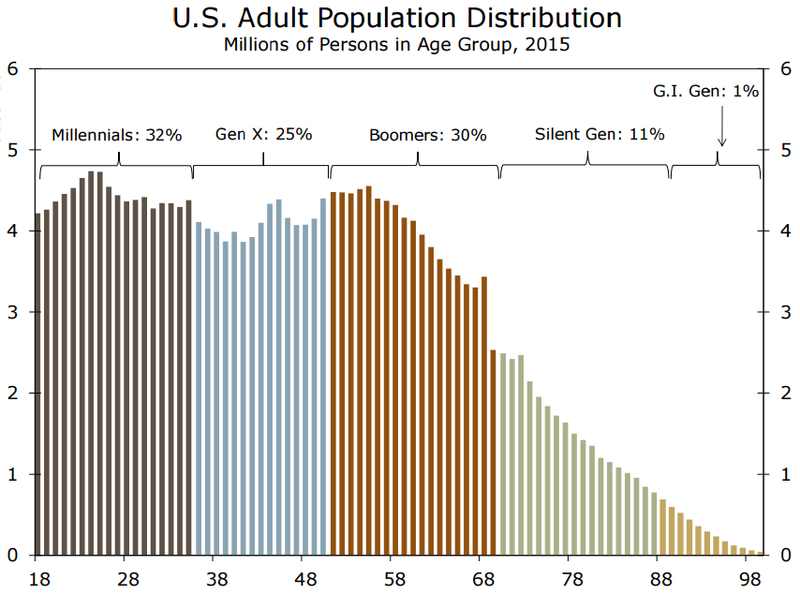 Given the sheer size of this population cohort, a Baby Boomer will turn 65 roughly every 9 seconds in 2017, and the Congressional Budget Office (CBO) estimates that the ratio of adults age 65 and over to those age 20-64 will rise from around 25 percent today to 38 percent by 2046. As a result, the effects on the economy have been, and will continue to be, substantial as more members of this generation retire. For example, Boomers exiting the workforce have helped push the labor force participation rate down to multi-decade lows, something that has contributed to the sharp declines in the government’s official measures of unemployment. Further, small business sales have been on the rise recently thanks to the growing number of Boomer business owners selling their companies to help fund retirement. Boomers exiting the labor force could also have a big effect on retail sales in the long run since personal spending habits can change significantly as a person ages, e.g. lower overall spending and a different composition of goods and services being purchased. 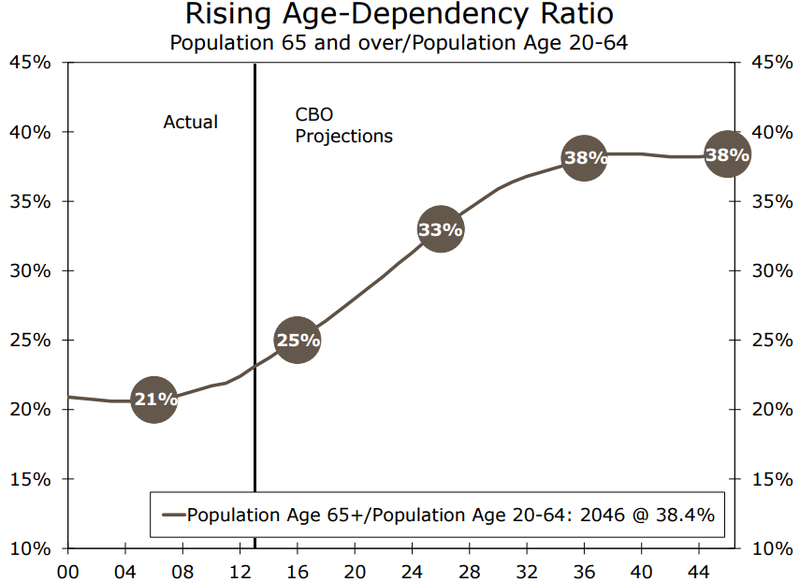 Perhaps even more important is that a lower worker-to-beneficiary ratio resulting from retiring Boomers has the potential to create a long-term financial sustainability challenge for popular government programs like Social Security and Medicare. Moreover, Boomer retirement readiness will be a critical issue going forward because younger generations may be forced to directly support their ill-prepared parents or indirectly support them through higher taxes. 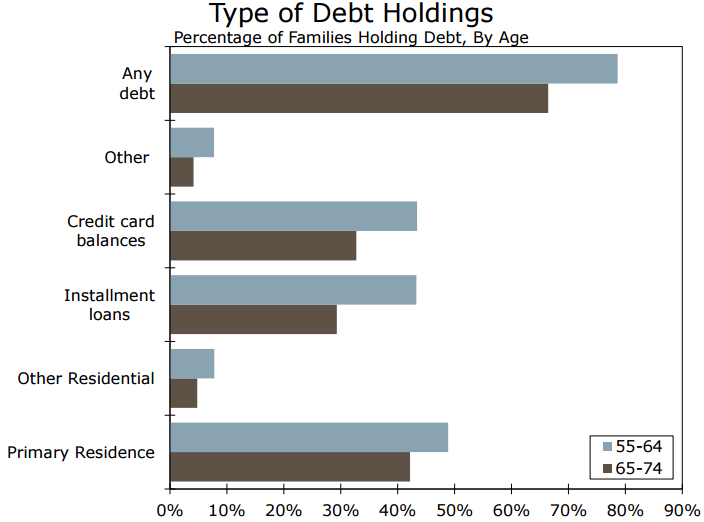 Amassing a sizeable nest egg can help avoid such challenges but a major obstacle exists for many older Americans: debt. Indeed, on Tuesday we learned that student loan obligations are a problem for many Baby Boomers but debt in general is an issue for an even larger number of older Americans. For instance, 79 percent of U.S. adults age 55-64, and two-thirds of those age 65-74, had some form of debt in 2013, according to a Wells Fargo analysis of the most recent data from the Federal Reserve Board of Governors. Further, the typical (median) Boomer, when compared to previous generations, not only holds more debt at this point in their life but the value of the debt has also risen (in inflation-adjusted terms). Unsurprisingly, housing comprises the bulk of the typical Boomer’s financial liabilities, and the median value of this type of debt for adults age 55-64 was around $100,000 in 2013. Other common forms of debt for Boomers include credit card balances and installment loans, although the median liabilities are much smaller (more manageable) at $3,000 and $12,000, respectively. 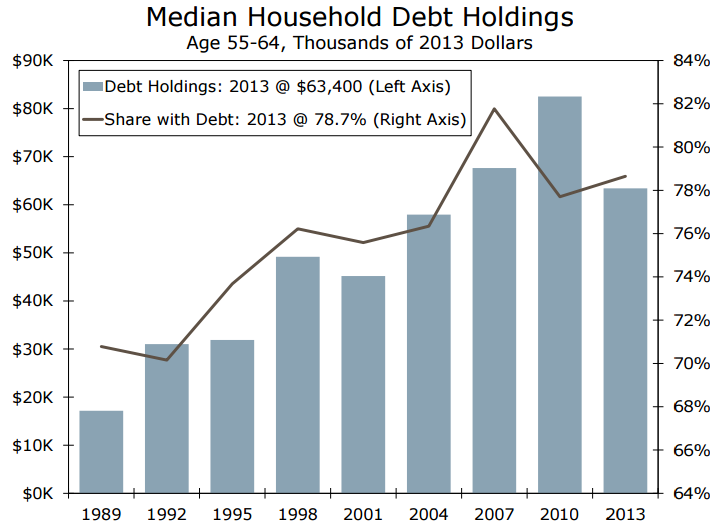 Average debt holdings, though, tend to be significantly higher than the median figures, suggesting that a subset of Boomers are much more leveraged than their peers.